During last nights fourth of July wedding I was graciously offered a piece of the wedding cake. I am often offered cake at the weddings I photograph. On a rare occasion I may choose to indulge in piece of cake but for the most part I decline. 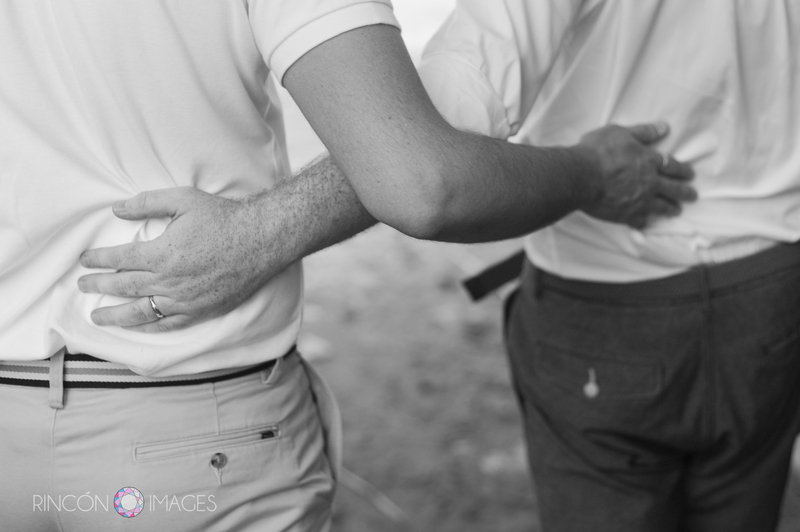 This got me thinking about why I don’t usually accept cake at weddings so I came up with “The 5 reasons why if I’m your wedding photographer I shouldn’t eat your cake”…. 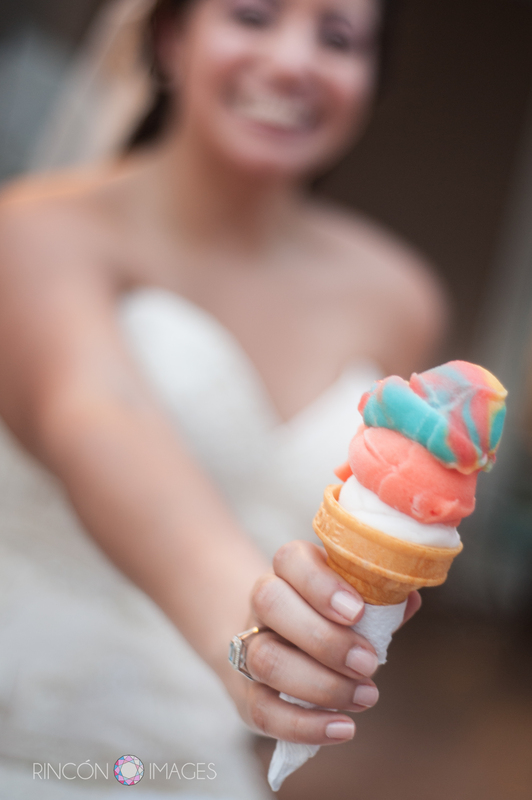 I can’t have all that sugary frosting on my hands while I’m trying to operate my top of the line DSLR to capture the magical moments of your reception. 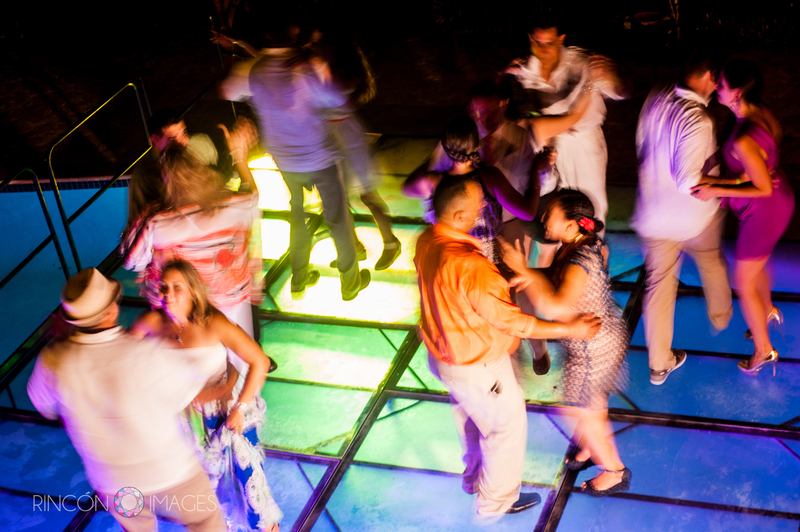 Guests having fun on the light up dance floor covering the outdoor pool just after the cake was cut. If I ate cake every Saturday that would put me waaaay over my desserts budget for the week… and sometimes I really like icecream on Sunday during Game of Thrones. I’m really more of an ice cream girl anyway… sometimes I’ll eat cheesecake but I’m not sure if that’s even considered cake or not. 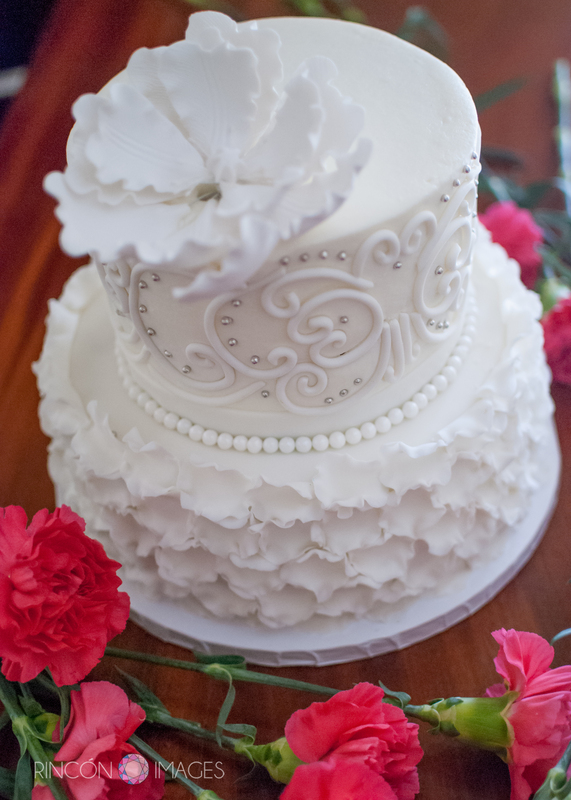 This bride had cream and cake for her wedding! Too fun! 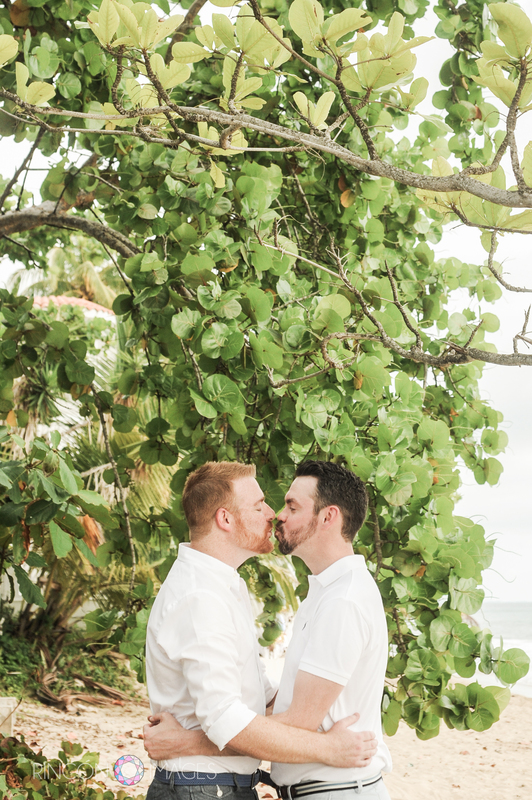 The cream was the perfect refreshing treat for a summer wedding in Puerto Rico. About 5 – 15 minutes after your cake has been cut and served all of your guests will be experiencing an extreme sugar rush. Combined with the champagne from the toasts this makes for an extreme spike in activity that I need to be level headed enough to capture on film at a moments notice. This bride and groom didn’t hold back at all after the wedding cake was cut. Frosting and cake flying everywhere! I must admit this was a great moment to photograph. Quite honestly, I really enjoyed the steak dinner you were so generous to share with me and I could probably go for a second helping of that instead… does anyone in the kitchen have a hidden bottle of A1? 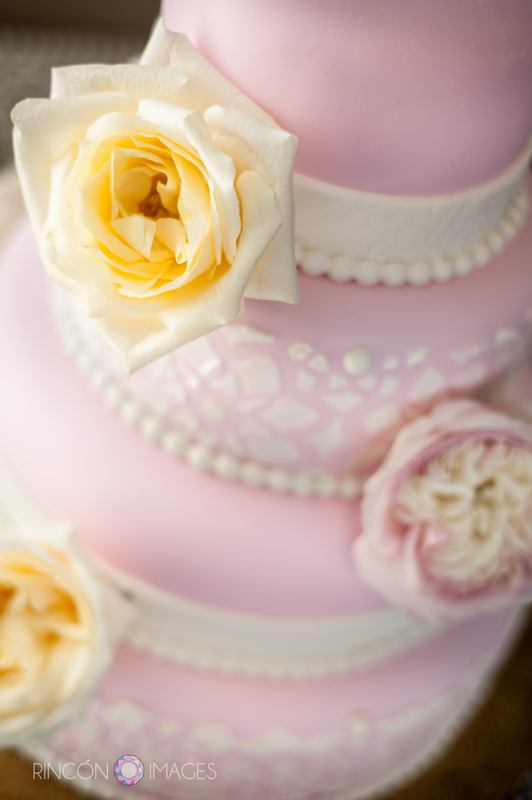 *** none of the wedding cakes pictured here were harmed by me in the making of this post. Just photographed and immortalized forever. I also have a Wedding Cake Pinterest Board dedicated entirely to the amazing cakes I have photographed at different weddings. 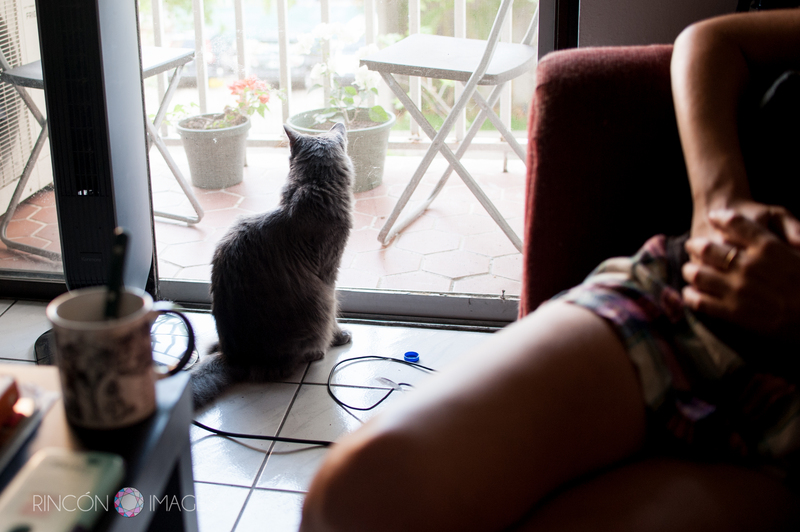 Aside from being inspired by the productive, professional and healthy lifestyle Andrea leads I’d say my favorite thing about spending time at her place is getting to visit with her two cats. There are few more peacefully way to wake up than to a cuddly cat purring at the edge of your bed. I’m currently a happy and proud dog owner but deep down inside I’m really a cat lady at heart. 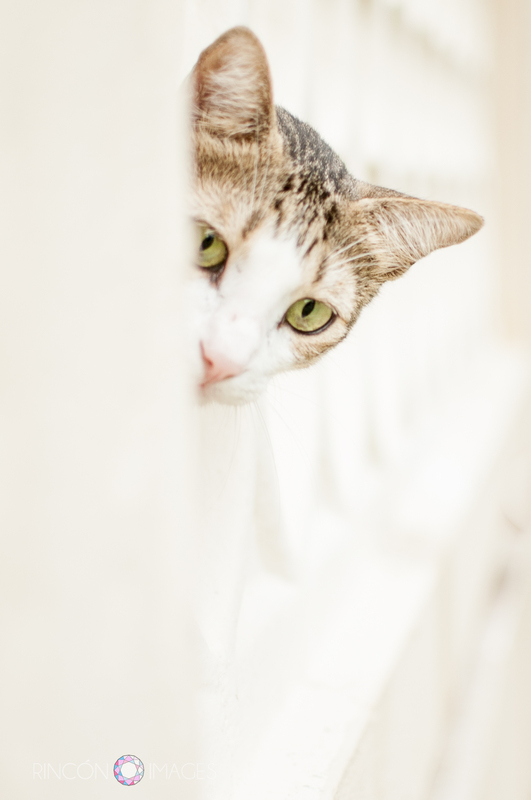 Take a peek at the animal and pet photography on my website. This is Andrea’s cat ‘Kuro’. He is an orange short tailed bobcat mix. He is named after Akira Kurosawa, a Japanese filmmaker. This is a head shot of ‘Kuro’, he is friendly and easy to photograph. He just loves to play and cuddle. Kuro was a rescued by Andreas boyfriend when he was just a little kitten. Usually when photographing animals I follow the same rules I use with people. I sit and wait. I wait for then to move into some great natural light before I start taking pictures. 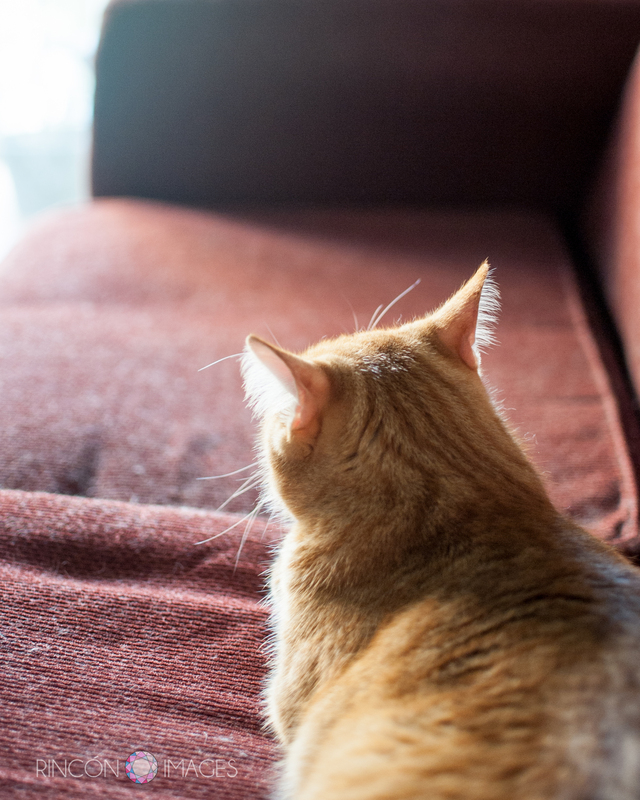 When photographing cats it is important to be patient. This is Andrea’s other cat Leonardo or ‘Leo’ as he is called by his friends. ‘Leo’ is a much more elusive cat and is much harder to photograph. 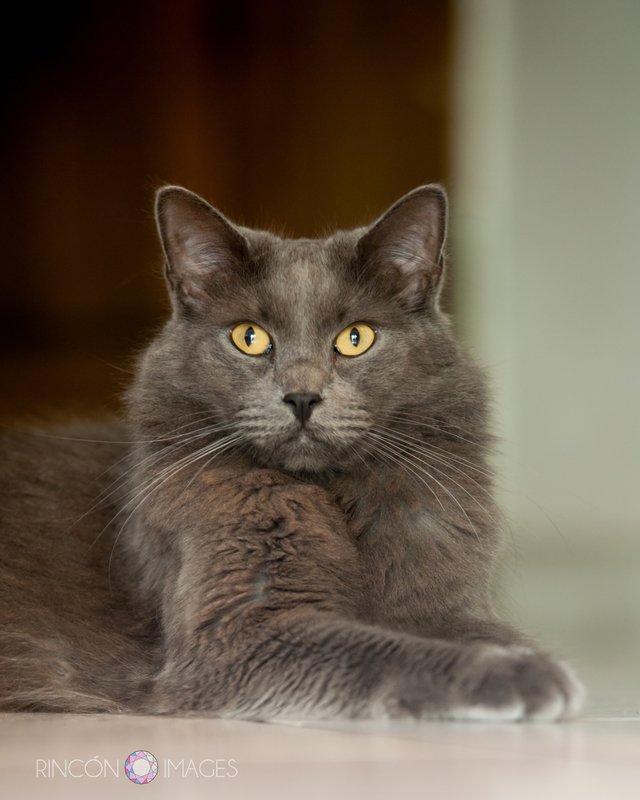 He is an absolutely beautiful long haired gray cat and it is worth the wait to take his photograph. It is out of focus in this photograph, but Andrea has a coffee mug with the Cheshire cat on it that disappears and reappears depending on the temperature of the liquid in the cup…. its the little details that reveal a true cat lover. And now for Leo’s close up! Leo was several feet away from the terrace window when I took this photograph. The light was dim so I slowed my shutter speed and set the camera on the floor to make this picture. 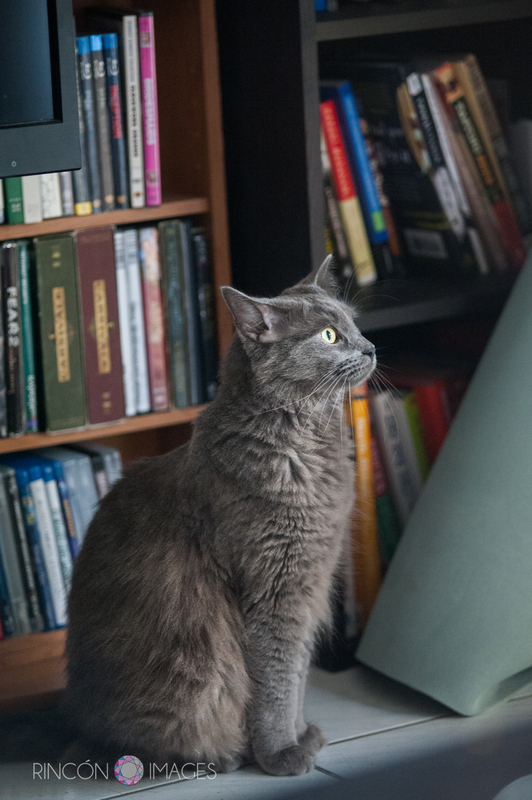 This is a photograph of ‘Leo’ in front of Andreas bookcase. He is sitting in the perfect amount of natural light here. Caterpillar: No, I do not ‘C.’ Explain yourself. Alice: I’m afraid I can’t explain myself sir, because I’m not myself, you know. Alice: Well, I can’t put it any more clearly, sir, for it isn’t clear to me. 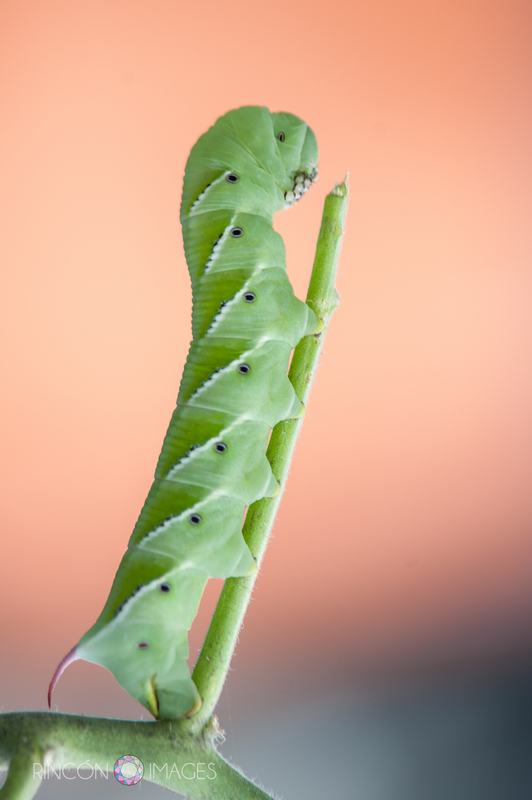 This is one of the caterpillars I photographed in the garden the other day. I can’t help thinking of Alice in Wonderland any time I see a caterpillar. They are such amazing creatures, the way they change into butterflies really is magical. These two caterpillars climbed into our tomato plants the other day and ate the whole plant! After they filled their bellies with tomato leaves they settled in to take a short nap on the branches. At first I thought maybe they were settling in to begin their metamorphosis, but later when I checked the plant they had climbed down from their branches. I love having the opportunity to photograph things in nature. The shapes and colors are so beautiful. Here in Puerto Rico there are so many opportunities to take pictures of amazing creatures. 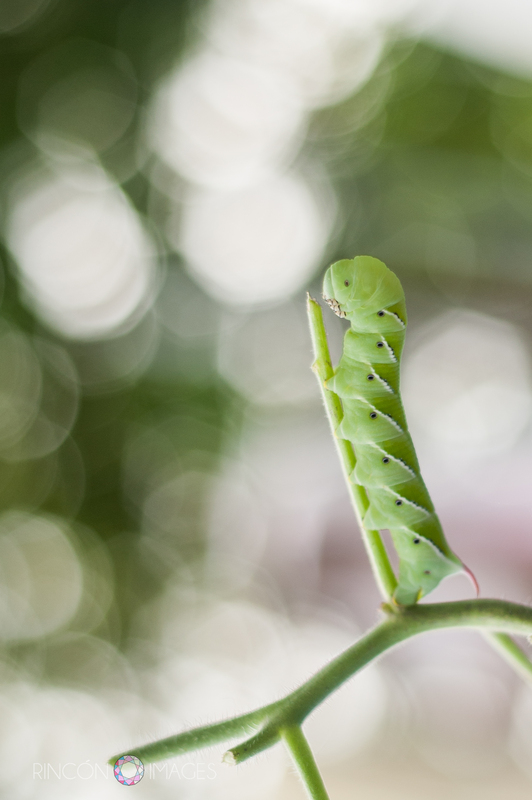 I used my 70-200mm 2.8 lens to photograph these caterpillars. 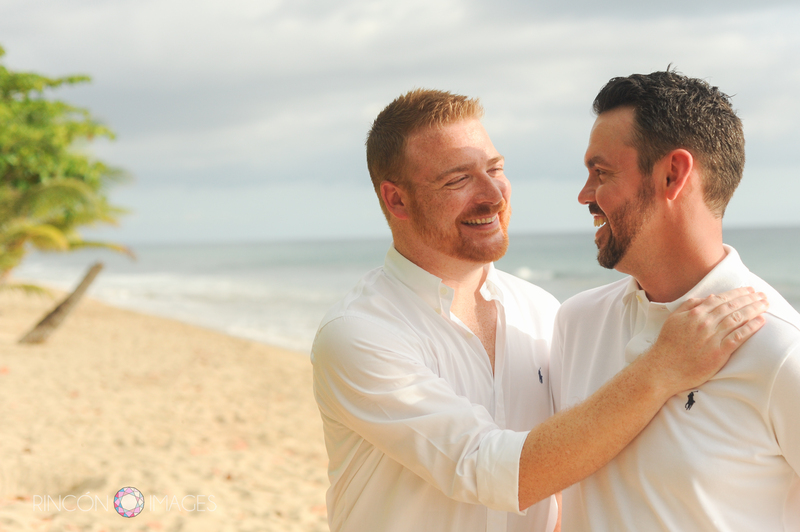 It was just a little before sunset so the lighting was nice and soft. Photography is a great way to examine things up close. By using my long lens I am able to see so much more detail in this photograph than I could using just my naked eye. I really love the way the green of the caterpillar pops out agains this orange background. 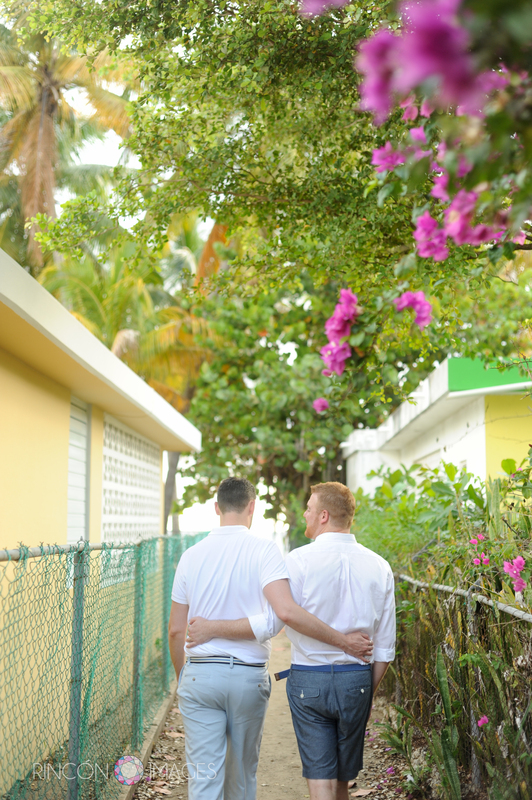 This past weekend I had a photo-session scheduled for 8am in Viejo San Juan. 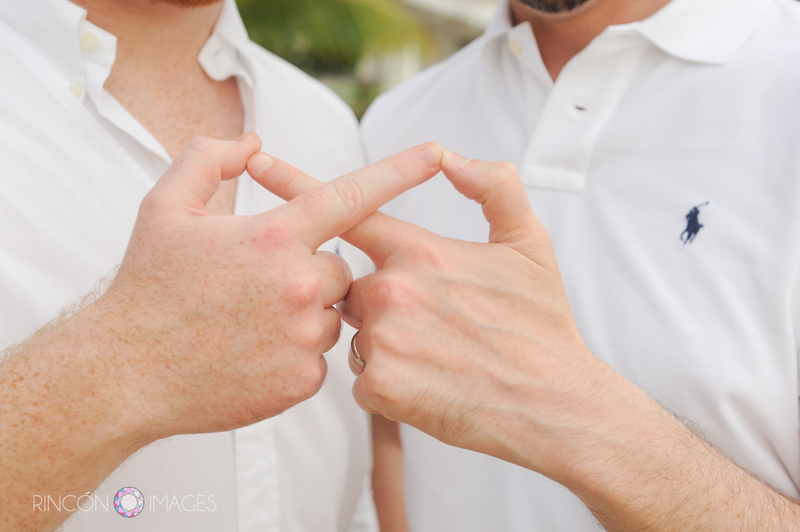 There were several large events scheduled in the San Juan area that morning creating unbelievable traffic, I was already in the city early to scout the location for my portrait session so I missed the traffic, but the couple I was supposed to photograph got stuck in the middle of it. 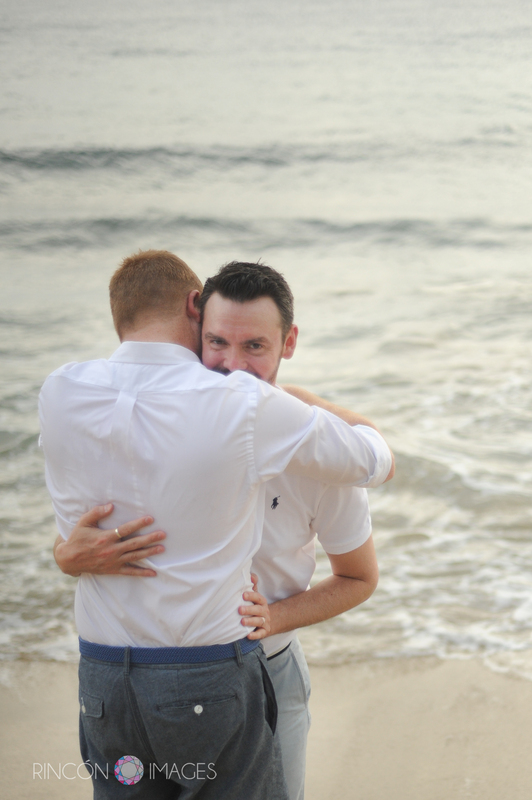 We decided to reschedule the photo session for sunset the following day. 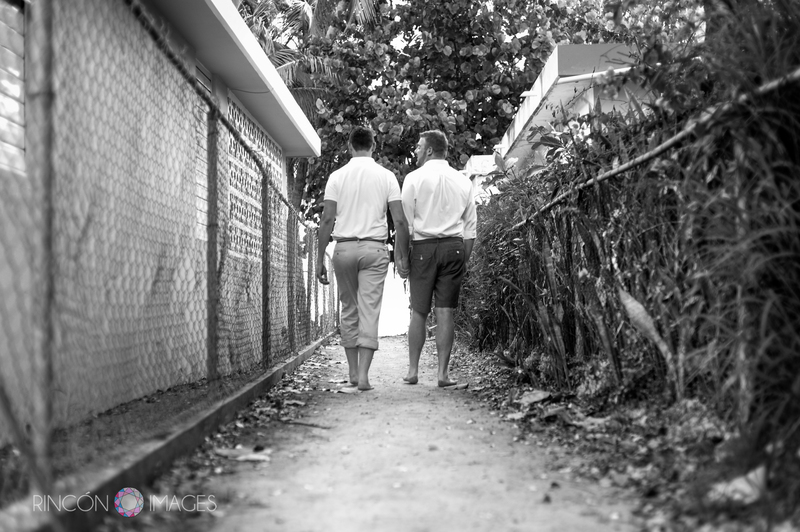 If found myself in San Juan with my camera and lenses on a bright sunny morning and decided to take a photo walk. One of my favorite places to photograph is the Cemeterio Santa Maria Magdalena de Pazzis. 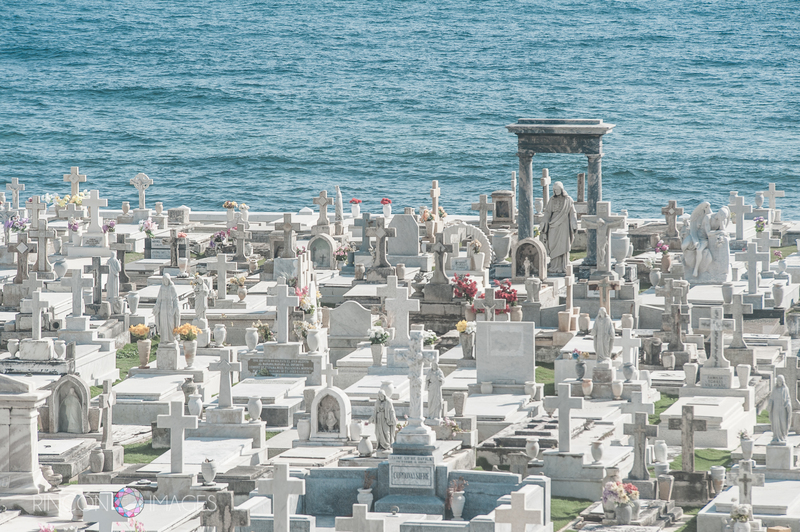 It is a beautiful cemetery nestled at the foot of El Morro with the caribbean sea as its back drop. To get there you go through a tunnel that is covered in graffiti. The whole place is so rich with metaphors, to me I don’t get a creepy sense being down there, things just feel peaceful. Last January I did a really interesting self portrait photography series there using my infrared camera. I love getting to revisit different locations. There are so many ways of photographing the same place. 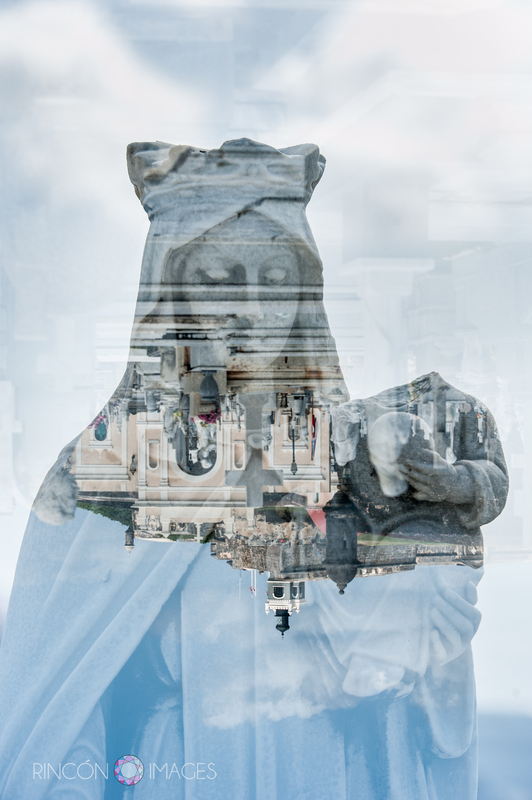 This time I did some experimenting with double exposures using the cemetery statuary as my models. The Santa María Magdalena de Pazzis Cemetery is located in Viejo San Juan, Puerto Rico. It is a great place to take photographs and has an amazing number of cemetery statues. 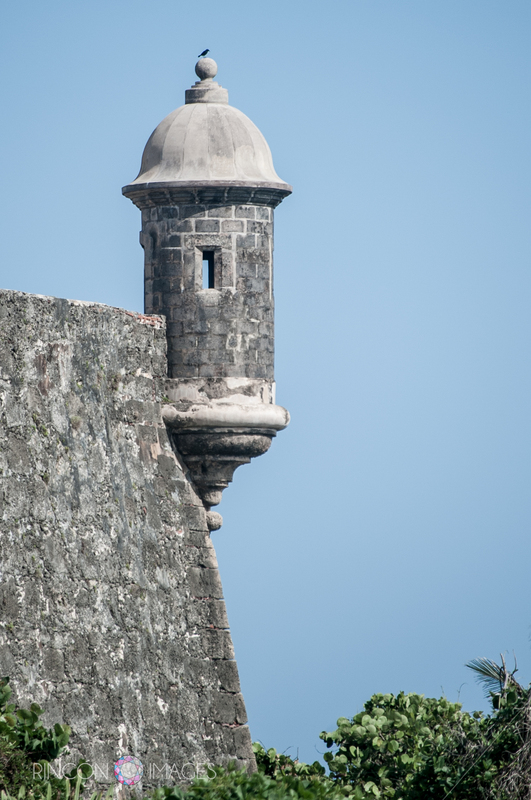 All over San Juan there are these ‘garitas’ or look out towers. 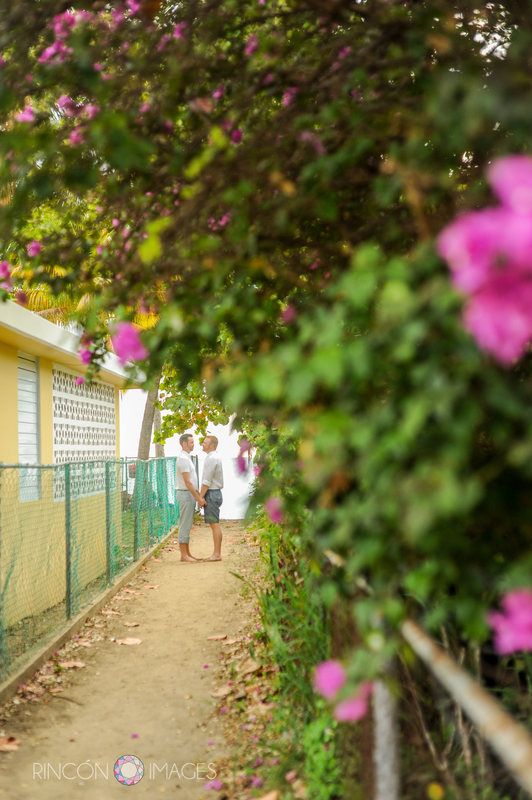 The shape and texture of them is iconic to Viejo San Juan. I can just imagine in the past someone looking out through those tiny windows watching the horizon for sail ships coming in on the trade winds. 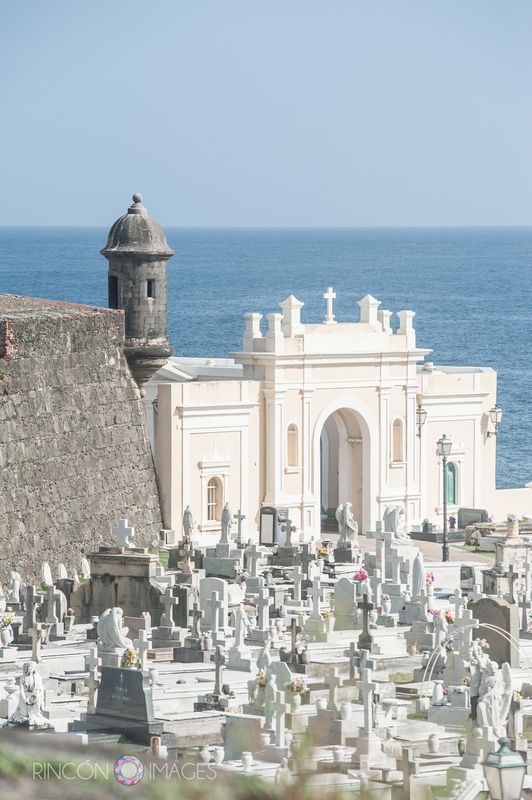 This view of the cemetery is from the lawn in front of El Morro. There are so many different angles and vantage points to photograph this place from. 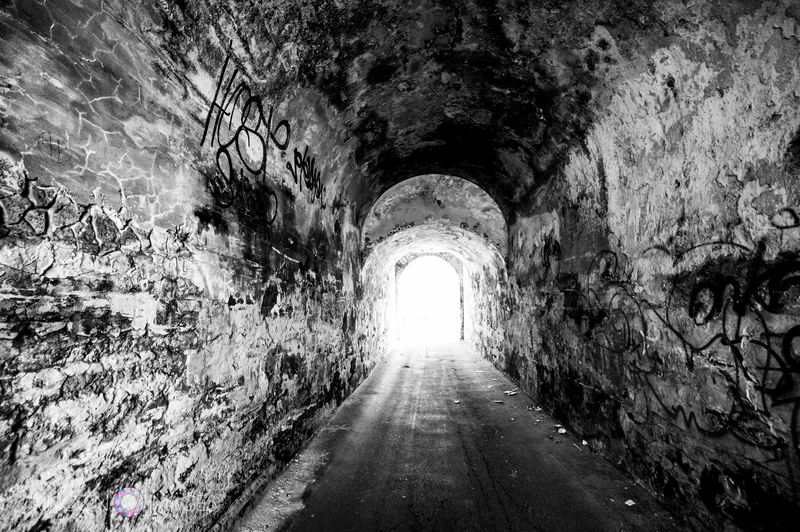 To get into the San Juan cemetery you need to first pass through a tunnel. The tunnel is covered in graffiti and always feels a little creepy to go through, even though during the day it is very safe. Going through the tunnel to reach the cemetery always makes me think of crossing over into the after life. The cemetery itself is named for the nun, sister Magdalena de Pazzi of Florence Italy who lived from 1566 – 1607. She is most remembered as a somewhat eccentric woman who was given to raptures and profound ecstasies through much of her life. When she first joined the sisterhood she became very ill and professed intense revelations while in an altered state on what everyone though would be her death bed. She survived the illness and continued to have visions and revelations through out her life that her fellow sisters transcribed in a series of five books. 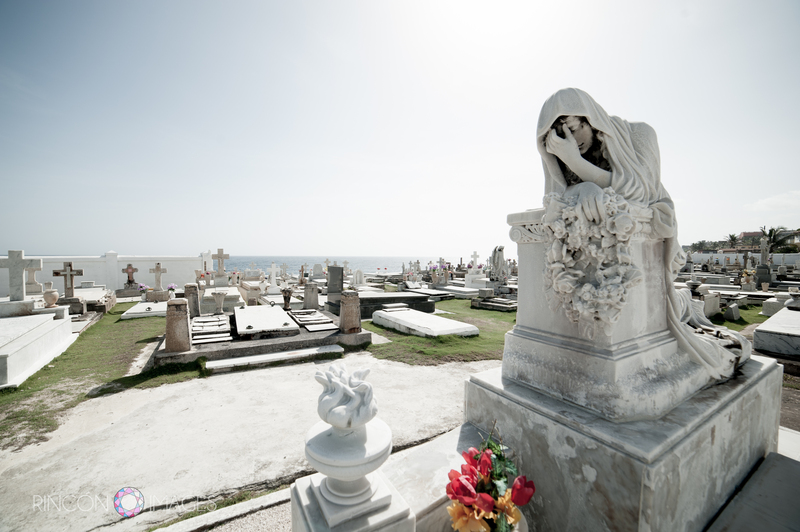 Her connection to the spirit world and her fiery personality make her a very fitting namesake for this cemetery on the caribbean sea. The variety of tombstones, cemetery art and statuary in this cemetery is breathtaking. Many common symbols are angels, crosses and figures of Jesus Christ or the Mother Mary looking over the tombs. In addition to these symbols there are also many mourning women and angels. One of the tombs even has statues of the surviving family members mourning around the outside of a casket. Some of the headstones are in better condition than others. The cemetery is maintained to an extent and family members still come to place silk flowers on the graves. A portion of the cemetery is currently under construction. This is my favorite statue in the cemetery. The posture of the woman is so beautiful and the emotion is so sorrowful. This statue was created by a very skilled sculptor and continues to endure the test of time. I have photographed this sculpture several times and look forward to seeing it in a new light every time I visit. 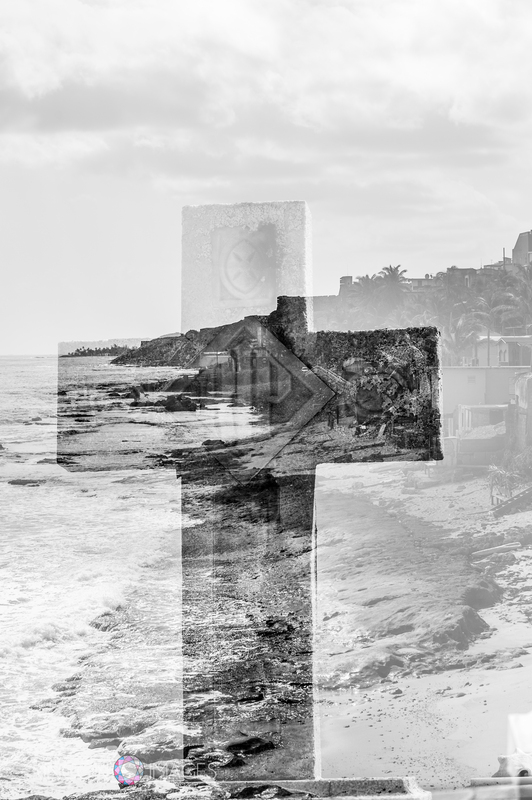 This double exposure is of a tombstone and the view of the coastline from the western part of the cemetery. 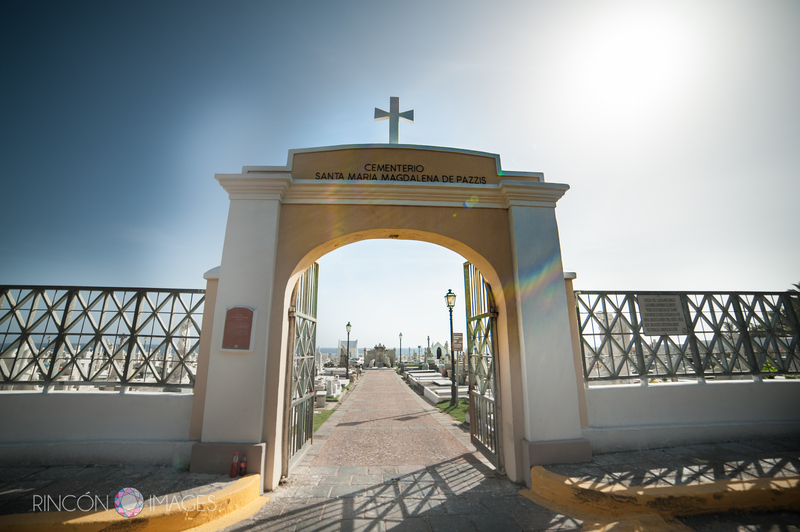 There is a community in Viejo San Juan called La Perla that you can see from the cemetery. 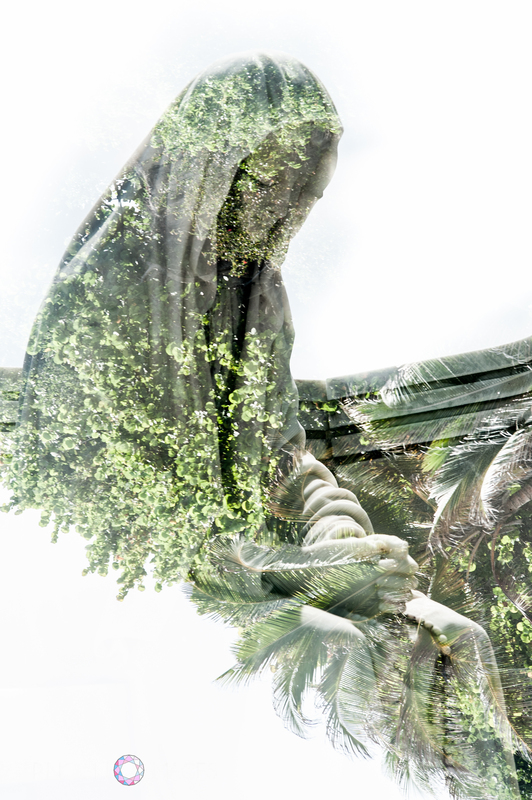 One thing I love doing with double exposures is playing with the orientation of the images. The flipped city scape against this woman’s face is an interesting perspective. 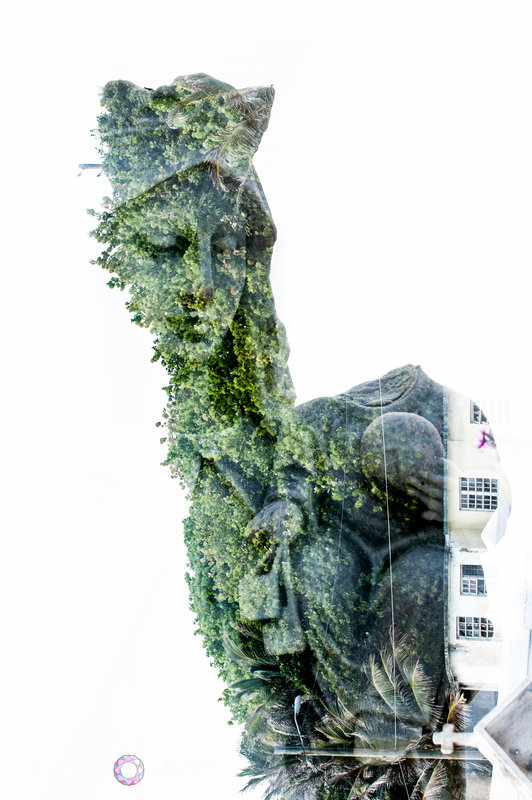 I first started experimenting with double exposures a few years ago and now I’m hooked! I love image manipulation and creating digital art in Photoshop, but I also really enjoy capturing a distorted image right in my camera. There is something really pure about creating a really amazing distorted image without using computer software. This technique involves setting the camera to capture two images within the same frame. In the days of film photography you just wouldn’t have wound the film over, today there is a special setting on the digital cameras that allows you to do more than one exposure in a frame. I usually start with a silhouette image and then look for a fun texture in the environment near me to fill in the details. 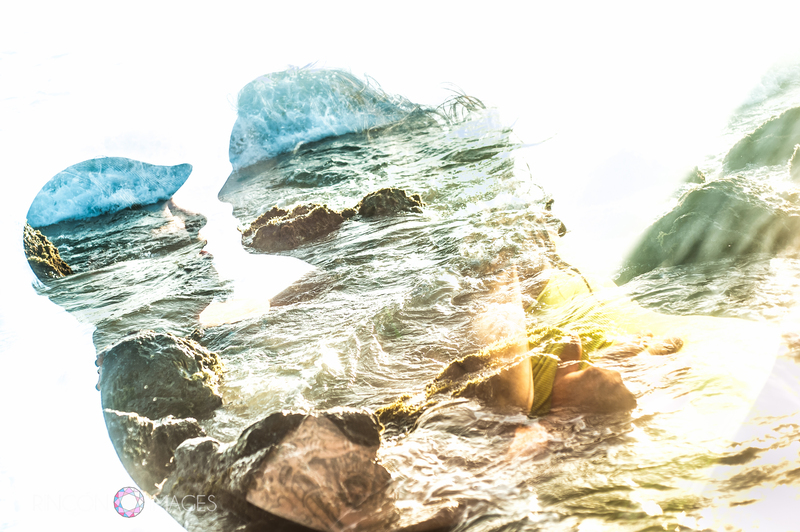 Double exposures add fun to a photo session and also help to tell the clients story a little better. 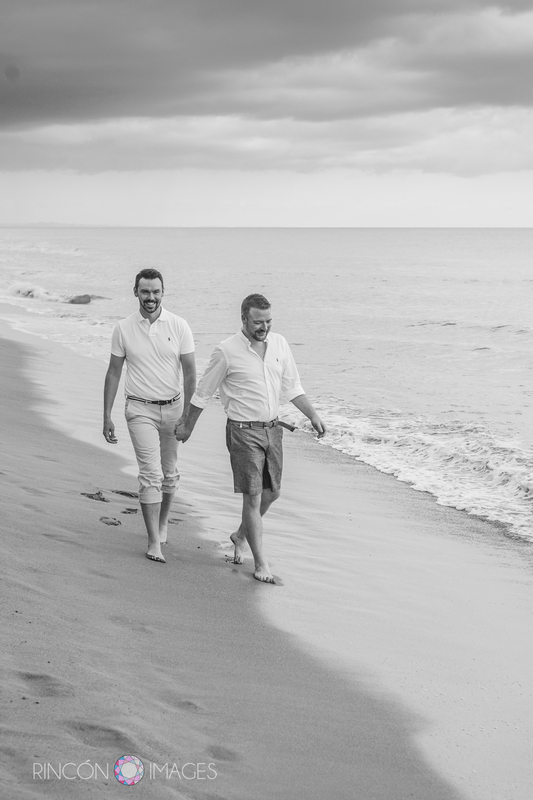 For ocean lovers, images of the beach and the sea merged into their portraits are perfect for adding some magic to the final collection of photographs. 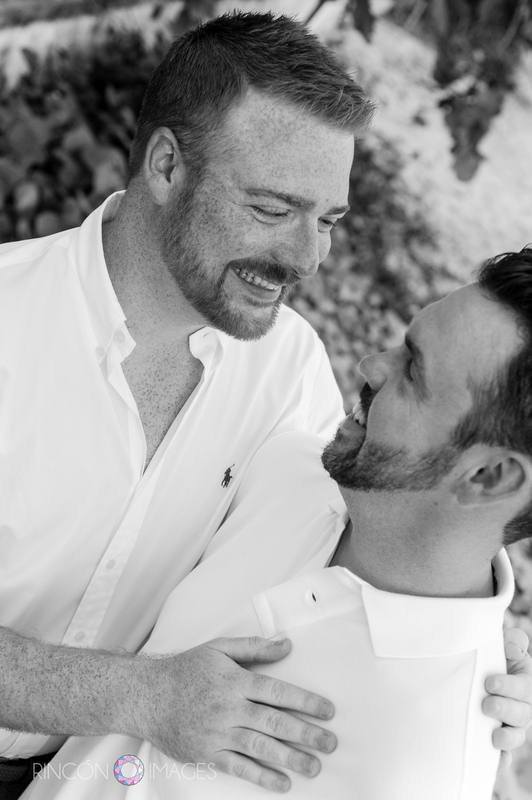 I absolutely love taking a few of these and then getting to show them to my clients on the back of my camera, it always makes people smile! 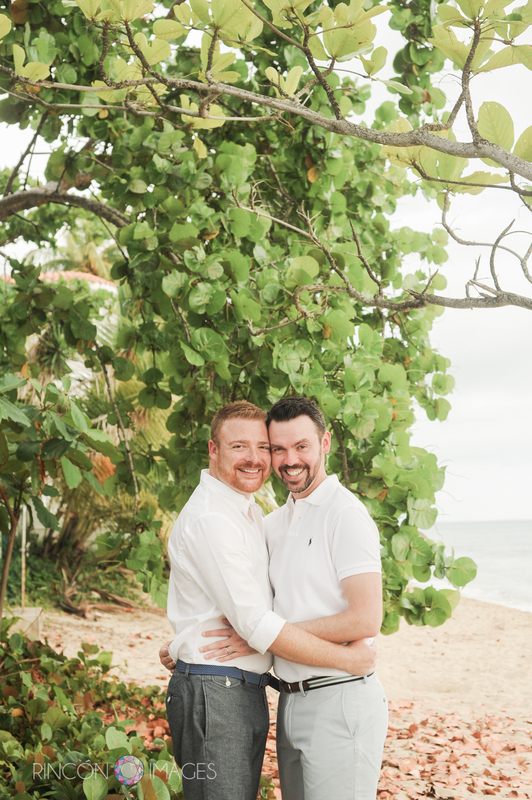 Just a couple of palm trees blowing in the breeze. 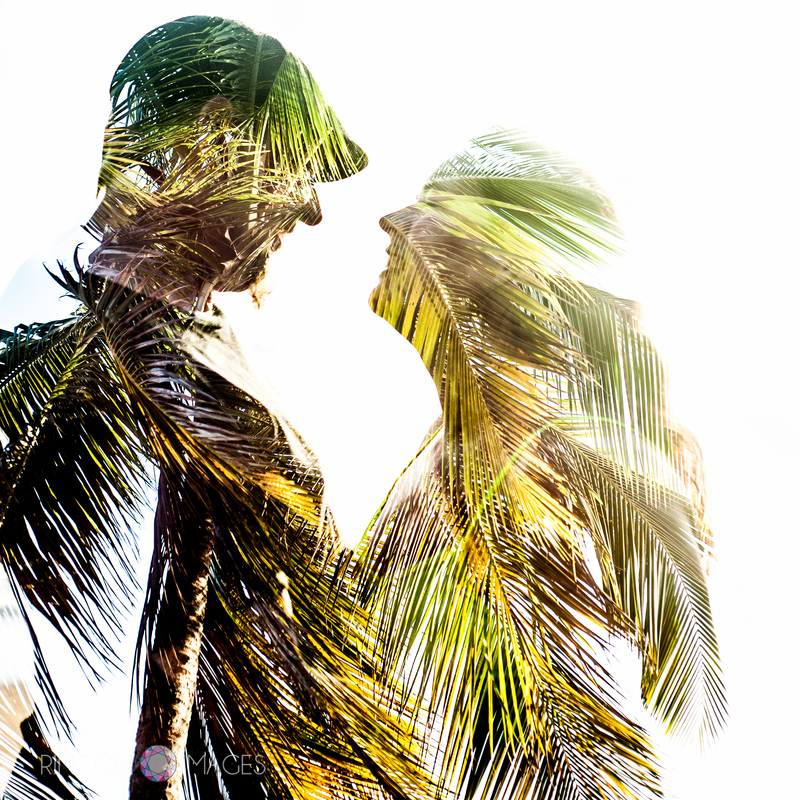 This double exposure photograph was taken on Barrero Beach in Rincon, Puerto Rico. Water is always a great subject for photographs. The way it reflects like and the amazing shapes it creates are always so ingesting visually. 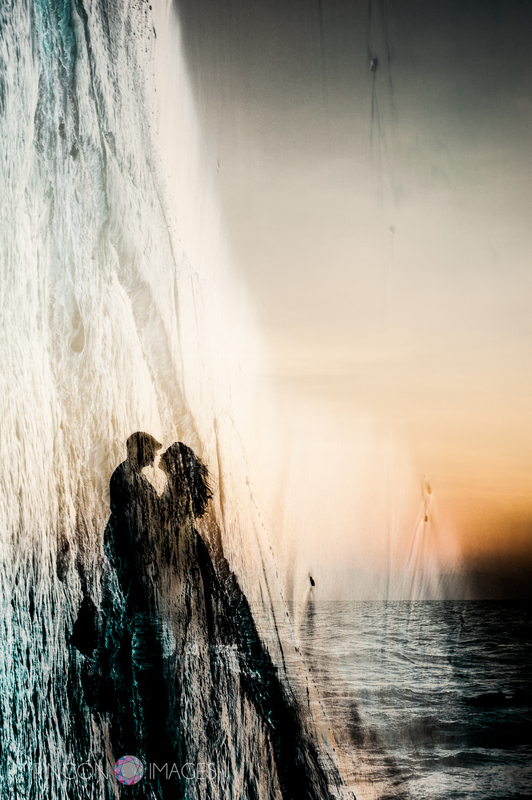 This double exposure is extra special because this couple really loves the ocean, so the photograph describes them perfectly. When making double exposure photographs it is important to experiment with the orientation of the camera. This particular photograph was made by combining a vertical image and a horizontal image. Bubbles and sea foam! The size relationship of the two frames combined here is what makes this image interesting. 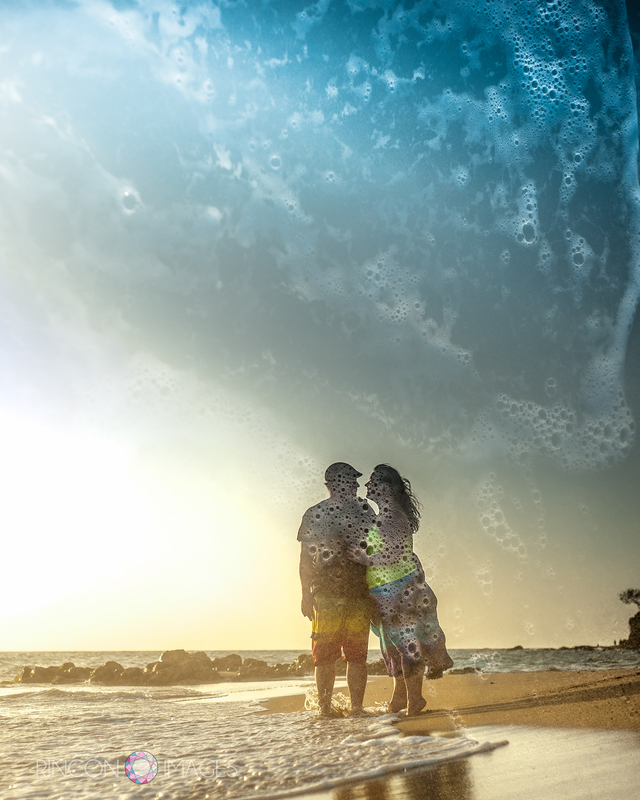 The tiny sea foam bubbles look larger than life agains the silhouette of the couple on the beach. I’m a cat lover, but currently the proud parent of a dog, so I enjoy any chance to cuddle with a cat that I get! 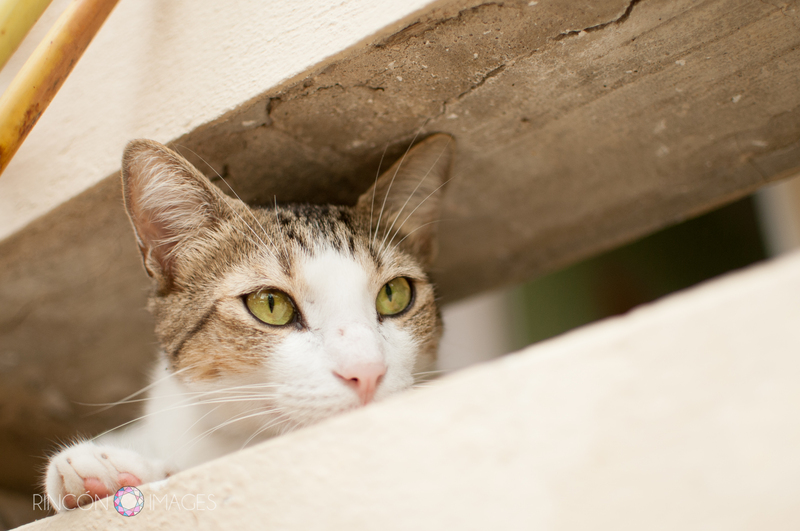 I had my camera with me and snapped a few portraits of Gatito on the porch outside of her house. 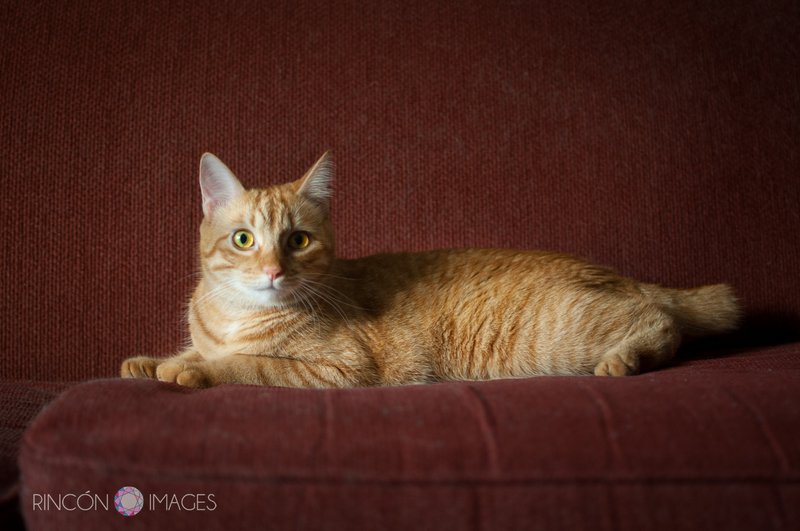 Pet photography can be a lot of fun. Its best to photograph animals when they are relaxed or playing. I like to get on eye level with animals or even a bit below them to make the portraits seem more personal. 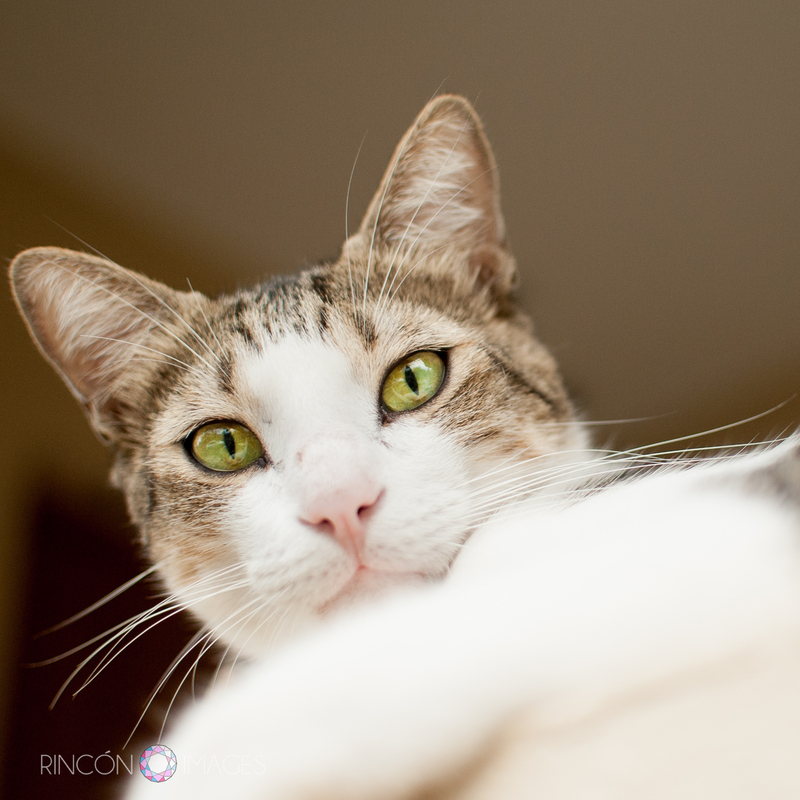 I have a portfolio of pet photography that you can check out here on my website. 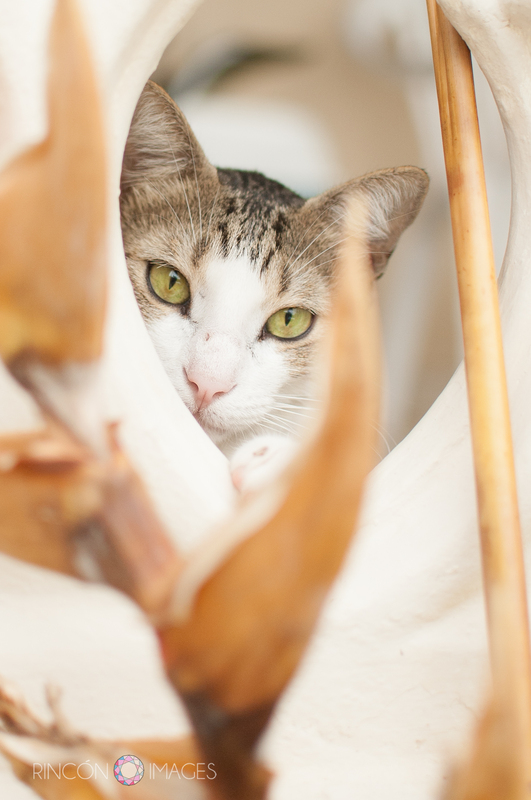 This was a fun shot, Gatito was peeking in and out of a dried up tropical flower. 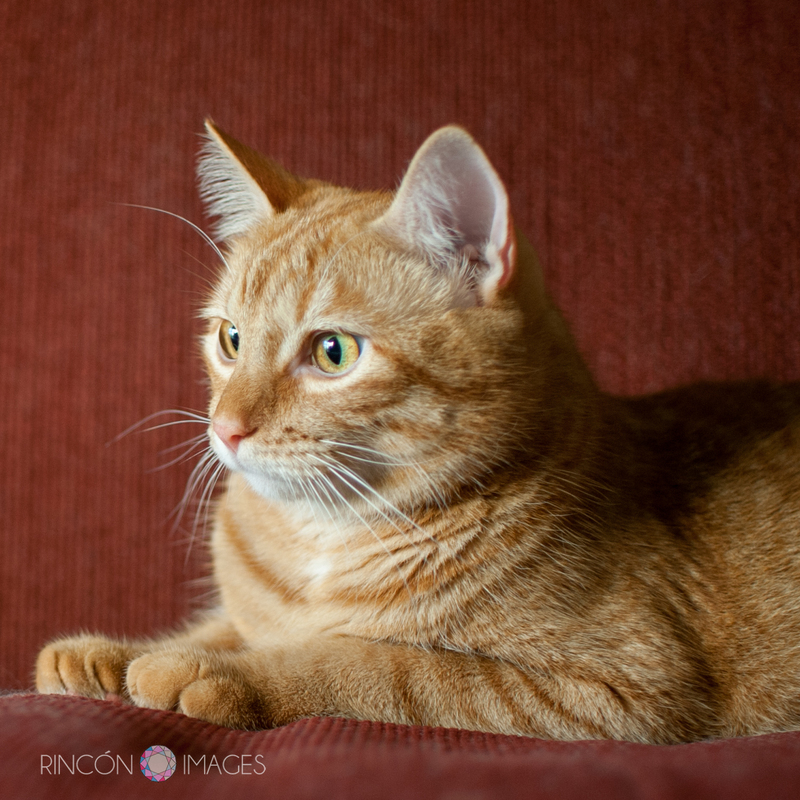 Cats make purrrfect subjects for practicing portrait photography.